Zufar started taking drawing and painting classes at age nine. He was eleven when he painted his first few plein air works; depicting nearby village cottages and a horse resting next to a carriage delivering pies to the local market. He found this kind of painting was so different from painting a still-life or a model in the art school studio. He fell in love with landscape painting and started exploring the language of direct expression of what just in front of him. When the time came to choose a college and profession, his soul calling for need to help people led Zufar to a medical career. During his study in medical school, residency, and finally a move to the United States, art never was left behind and continued to be an essential part of his self-actualization. Zufar was honored to participate in the exhibit “Doctors Paint” in the State Museum of Fine Arts in Kazan and at Yale Medical School. Zufar’s town and landscapes style lean towards Russian and Soviet era impressionism. For him art is a continuous experimentation and growth. Through over a decade, traveling and painting in the US changed his painting palette to a higher key. Spur of interest to plein air painting in the United States brought the artist to national level competitions, where he won a number of awards. Among others, Zufar treasures most his several Artist Choice awards at Plein Air Easton (Maryland). Receiving “Medal of Honor and Merit” from Kent Art Association (the first art organization in the US he had joined) is another one of his most memorable achievements. The Award of Irvine Museum, he received recently at the Laguna Plein Air national competition (Laguna Beach, California) is another valuable award he was honored to given. His works are widely present in private collections in the United States – from New England to California — in the UK, Spain, and of course in Russia. Zufar has a number of followers of his art and considers teaching art another significant point of his artistic career. Zufar Bikbov Zufar’s interest in painting came early in life from the influence of his father, a well-respected specialist in engineering. His father’s dream to become an artist could not be realized in post WWII Soviet Union during Stalin’s regime era. Being accepted to Nicolai Fechin Art school in Kazan (Russia), he had to switch to the school of Engineering and Architecture. “My dad never pushed me into an art career”, recalls Zufar, “however, albums of my father’s watercolors and a library of Russian Fine Art at our home, along with my father’s paints and brushes – this environment became fertile soil for the seed of my artistic talent to grow.” Zufar started taking drawing and painting classes at age nine. He was eleven when he painted his first few plein air works; depicting nearby village cottages and a horse resting next to a carriage delivering pies to the local market. He found this kind of painting was so different from painting a still-life or a model in the art school studio. He fell in love with landscape painting and started exploring the language of direct expression of what just in front of him. When the time came to choose a college and profession, his soul calling for need to help people led Zufar to a medical career. During his study in medical school, residency, and finally a move to the United States, art never was left behind and continued to be an essential part of his self-actualization. Zufar was honored to participate in the exhibit “Doctors Paint” in the State Museum of Fine Arts in Kazan and at Yale Medical School. Zufar’s town and landscapes style lean towards Russian and Soviet era impressionism. For him art is a continuous experimentation and growth. Through over a decade, traveling and painting in the US changed his painting palette to a higher key. 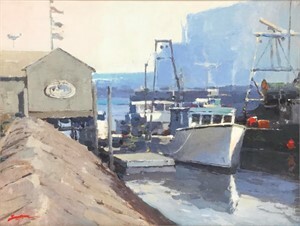 Spur of interest to plein air painting in the United States brought the artist to national level competitions, where he won a number of awards. 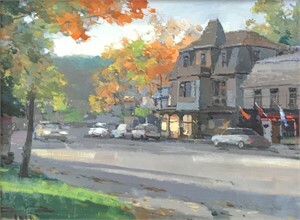 Among others, Zufar treasures most his several Artist Choice awards at Plein Air Easton (Maryland). Receiving “Medal of Honor and Merit” from Kent Art Association (the first art organization in the US he had joined) is another one of his most memorable achievements. The Award of Irvine Museum, he received recently at the Laguna Plein Air national competition (Laguna Beach, California) is another valuable award he was honored to given. His works are widely present in private collections in the United States – from New England to California — in the UK, Spain, and of course in Russia. Zufar has a number of followers of his art and considers teaching art another significant point of his artistic career.